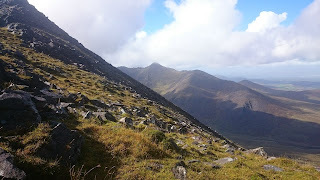 On Sunday Sept. 24th six of us set out on our latest trip, this time our destination was Strickeen & Cruach Mor which lies in between Carrantoohill and Purple & Tomies as well as overlooking the Gap Of Dunloe and the Black Valley. For most of the day we had good enough weather with some nasty showers thrown in but overall taking in the time of the year the weather was good with a lot of clear skies which leads to great scenery. The rain we did have came in heavy bursts and also there was very little cloud or fog overhead. I think this trip was probably one of the most spectacular we have been on in that the views and scenery on all sides of us all day were spectacular with the clear views of the Magillycuddy Reeks on one side and Tomies & Purple Mountains on the other side. The walk itself started at Kate Kearneys Cottage and then out the road towards the Gap Of Dunloe and after a while out taking a turn right up a mountain pathway which leads onto Strickeen Bog, I suppose we were lucky here in the day we had in that even though it is a bog there is ways through in not too a mucky way, you just had to pick your way. This pale is somewhere overtime people have got lost on their ways but now because a fence has been put up, all you have to do is follow the fence and it will lead you straight to Stickeen Mountain and from here you can look across to Cruach Mor. When you get up to this level it is important to have good guides as it would happen quite easy that the fog could come down on you and you could lose your way. We were near here a few months ago and even with an experienced leader but with the fact the fog came down on us we found it hard to find our way, so it is important to be prepared. One slight bad thing about this day was as we progressed along our way we found the rocks could be very slippy in places , so you really had to mind your step. As we got to the top of Cruach Mor and with the fact we had a clear day you could see for miles in all directions from back to Kenmare Bay to North Kerry and North West Cork and even though it was a bit cold it was dry and clear and that made it all worthwhile. As I said already this was probably one of our best trips or maybe that was just because it was a new and different route, but it was a great day out with the usual good company.